One man's trash is another man’s treasure, so goes the saying. For some entrepreneurs, this has become the new business mantra. From discarded bottles and worn-out tyres to old newspapers and ragged shoes, young professionals are recycling waste as a full-time business with a social message. Anu Tandon Vieira’s Retyrement Plan is one such venture. Using old tyres of all shapes and sizes and sustainable material such as cane and bamboo, Anu and her team of artisans create a range of quirky furniture that can be used as chairs, tables, pouffes or mirrors, and even cat scratch pads. While Anu sources the cane and bamboo from Assam and Karnataka, she purchases tyres from a supplier in Mumbai at Rs. 50-Rs. 100 per tyre. Work begins only after the tyres are washed and sanitised. To weave the material together, she purchases ropes from suppliers and textile tailors in Gujarat and Rajasthan. These ropes are fashioned from waste such as scrap fabric. The handcrafted furniture, therefore, is a rainbow of recycled material. “The emphasis is on producing beautifully designed woven pieces of furniture without compromising on the quality, and finding markets that value them,” says Anu. She believes finding cheap raw material will never be a problem because “the cities are spewing waste”. The challenge is how much of this can be recycled and utilised, she adds. With a post-graduate diploma in textiles from the National Institute of Design, Ahmedabad, Anu has a hands-on approach to translate her motto of living green into a sustainable business enterprise. She invested Rs. 1 lakh as seed capital and started Retyrement Plan with a two-fold objective: to recycle waste into sustainable commodities and showcase the skills of artisans. She found migrant cane weavers from Assam, West Bengal, Bihar and Karnataka and took them on board, training them herself. Today, she employs six full-time weavers and 8-10 workers to help her in projects. “Our weavers and frame-makers earn Rs. 600-Rs. 700 per day on an average. Even if a single weaver is able to regain a sense of pride in his or her traditional skill through our efforts and wishes to train the next generation to carry it forward, we would have largely achieved what we set out to do,” she explains, adding that she looks at profit not in terms of monetary gain, but in the numbers of labourers she has employed. As quality is paramount, Anu does not rush her workers, who might take two to three days for a pouffe and up to six days for a chair. Prices of the products range between Rs. 3,000 and Rs. 20,000. “Anu’s Retyrement project is vibrant and functional and is perfect for brightening up spaces. The best part is that she uses waste material in such a creative way that you end up wanting more,” says film stylist and Retyrement customer Pampa Biswas. The venture has tie-ups with stores in Goa, Mumbai, Bengaluru and Vadodara. But Anu prefers to sell the products herself. “It allows me to interact with my customers and tell them the story behind each piece. I also get many ideas. For instance, I learnt that pet lovers adored my ottomans since their cats could scratch them, nestle in them and play with them. This inspired us to make cat scratch pads with old bike tyres,” she says. Axomnia is another upcoming brand from Assam that transforms waste material into products of utility and art installations. 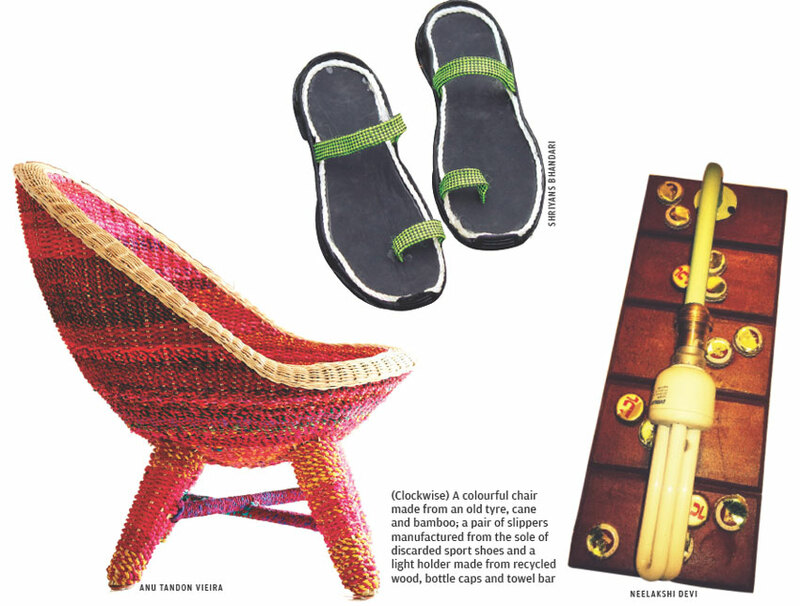 Started by textile designer Neelakshi Devi, Axomnia uses different kinds of waste—scrap handloom fabric, bottles, cans, newspapers, sawdust, woodplanks, twigs, CDs, discarded furniture—to redefine junk. “The message of Axomnia is that nothing that we use today actually turns old. It is the appeal that becomes boring,” says Devi. The USP of the brand, she claims, is recycling old furniture into modern and trendy ones. This, she adds, does not require investment. Axomnia collects old furniture, say a sofa, chair or table, from households and transforms them with a completely new look, either to be used as a piece of furniture or a different product of utility. “Many people like buying antique products for their homes, but they are very costly. Axomnia takes your old gear and gives it back to you after painting it or changing its purpose, say transforming a chair into a shelf with minor modifications. Since we only charge for the service, it is pocket-friendly,” explains Devi. 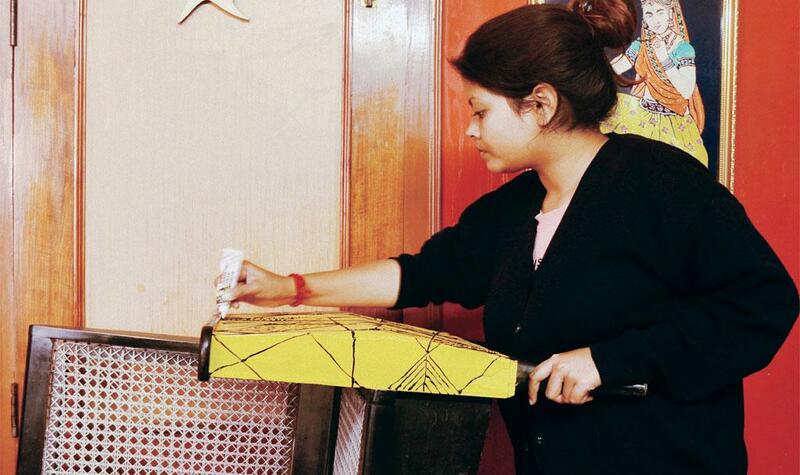 Guwahati resident Subhalaxmi Bordoloi tried Axomnia’s service during the renovation of her home. “My parents were not sure what to do with the old furniture. As there was an emotional connect, they did not want to discard them. I came across Axomnia’s Facebook page and decided to take a chance. I was amazed at the stylish transformation of our old furniture. Axomnia’s service is value for money,” says Bordoloi. Axomnia has a range of fashion accessories such as stoles, necklaces, bracelets, pouches and bags and home décor items such as chairs, lamps, chandeliers, cushion covers and showpieces. “My brand is trying to recreate the magic of lost textiles and textile techniques such as weaving and bring them in vogue again. This concept is sometimes generated through art, such as recycled wall art and installations,” says Devi, an alumnus of the National Institute of Fashion Technology, Chennai. Axomnia’s operations are handled solely by her, but she occasionally takes the help of weavers. Prices depend on time consumption, detailing, material used and its availability. Decorative bottles are priced between Rs. 700 and Rs. 800, while stoles made from scrap fabric cost a minimum of Rs. 600-Rs. 700. Currently, the brand sells its products through a lifestyle store in Chennai. Two other stores in Delhi and Guwahati are in the pipeline. 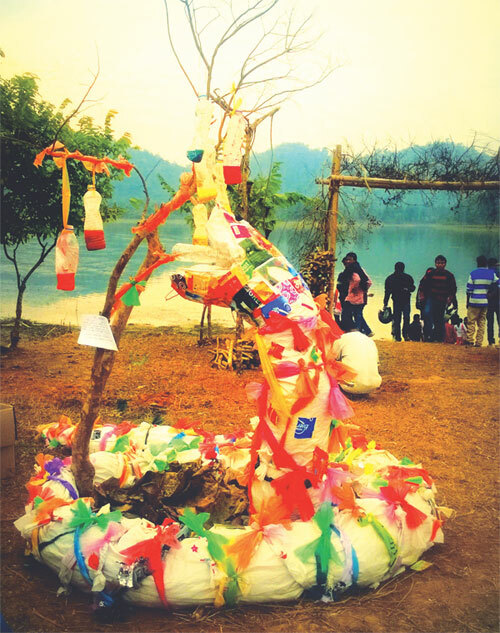 Devi says sustainable waste management is emerging as a lucrative business because people now understand the importance of sustainable living, apart from the aesthetic quotient related to it. Axomnia exhibited this concept at the Art of Revolution, an art event held in January this year in Chandubi, a resort near Guwahati. “We installed a 3D structure using 300 plastic bags generated from a single household over a month. Our motive was to compel people to think how much hazard a single house can cause to nature. This exhibition strengthened my vision of working towards recycled and upcycled products,” Devi says. Greensole, a social-business venture started by athlete-duo Shriyans Bhandari and Ramesh Dhami, recycles old sport shoes into slippers for the needy. The idea originated with the frequent discarding of sport shoes by both friends. “We used to throw away at least three to four pairs of shoes every year. We learnt that the sole of the sport shoe can be converted into footwear,” says Bhandari, cofounder and chief executive officer, Greensole. They converted their idea into a full-fledged business in December 2013. The major source of funding for Greensole has been prize money and Rs. 1.5 lakh through self-finance. The co-founders have also collected Rs. 7,000 from crowdfunding. Greensole has tie-ups with schools and sports clubs and organisations who provide them with discarded shoes, while it purchases recycled ropes from suppliers. The cofounders have also put up drop boxes at public places in Mumbai, Ajmer and Siliguri where people can donate their old shoes. Once the shoes are collected and sorted according to size, they are sent to Greensole’s manufacturing unit in Kurla, Mumbai. Here, the shoes are washed, the sole is then detached using a hot blower. It is washed and wiped with tolin, which helps in disinfection. The shoes are put in a mold to determine the size and pattern. “For those shoes whose soles are in bad condition, we add a layer of recycled material to get it back in shape, and the ones which are completely damaged, we use them to make slippers,” says Bhandari. Currently, Greensole manufactures about 1,500 slippers every month. It employs five labourers, in addition to interns and volunteers. The labourers have been trained by experts from the Footwear Design and Development Institute, Kolkata. According to Bhandari, about 350 million sport shoes are discarded globally every year. Since these are made up of polyurethane, foam and plastic, they are non-biodegradable and towards the end of their life, they are either dumped or end up in landfills where they are burnt, generating close to two million tonnes of carbon emissions. “A typical pair of synthetic trainers generates about 0.02 tonnes of carbon emission, which is equivalent to a 100-Watt bulb burning for a week. The idea of Greensole is to stretch the life of a shoe, so that it can be reused multiple times as comfortable and eco-friendly slippers,” Bhandari adds. The company’s motto is to provide a pair of slippers to every needy person in the world by 2023. Sounds ambitious? Bhandari believes it is feasible both in terms of labour and funds. “We have registered in a few international competitions. If we win, we will get about US $1 million in funding and will use the prize money to set up a fully automated unit refurbishing two million shoes a year. Otherwise, we will take investors on board,” he says. So far, about 110 poor people in Mumbai have benefited from Greensole. The company successfully filed for two industrial design patents in November 2014. They plan to open a factory in Kenya to help the poor in Africa. Tie-ups with the United Nations, Asian Games and Olympics are also on the anvil.